The City of Toronto shouldn't fund a body tasked with planning and developing valuable waterfront land, says Coun. Doug Ford. The brother of Mayor Rob Ford said Waterfront Toronto, the agency formed in 2001 by the federal, provincial and municipal governments, is a waste of money and the city should cut its ties with the body. "It's nothing against the folks at Waterfront, but that was the biggest boondoggle the feds, the province and the city has ever done," he told reporters Wednesday. "You don't subsidize the most valuable property in Canada to the tune of $10 million an acre. You let the private sector buy it and let them develop it." Ford said he believes the city can still control the nature of development even if the land is opened up to private development. "We can say, you know, we want a round building here and we want a square one here. But we can control the development," he said. "But we don't spend $1.5 billion of tax dollars when everyone's feeling the pressure federally, provincially and municipally." The municipal, federal and provincial governments each kicked in $500 million in seed money for Waterfront Toronto. The agency has a long-term plan to revitalize some 800 hectares of government-owned land along the city's waterfront, large swaths of which are industrial lands. It has spent around $750 million on investment since its formation to March 2010, which is when the last audited statements of the corporation were released. The agency plans on investing an additional $1.3 billion over the next five years on waterfront revitalization. The CEO of Waterfront Toronto, John Campbell, said the agency is getting a "lot of private-sector involvement in the waterfront." He said developers Great Gulf, Urban Capital and Hines are all working on developments along the waterfront. "I think you have to look at what we've done and a lot has been accomplished," he told CBC's Metro Morning on Wednesday. "You have to also bear in mind you get a chance to rebuild your waterfront once every couple of centuries and we've got to do it right." 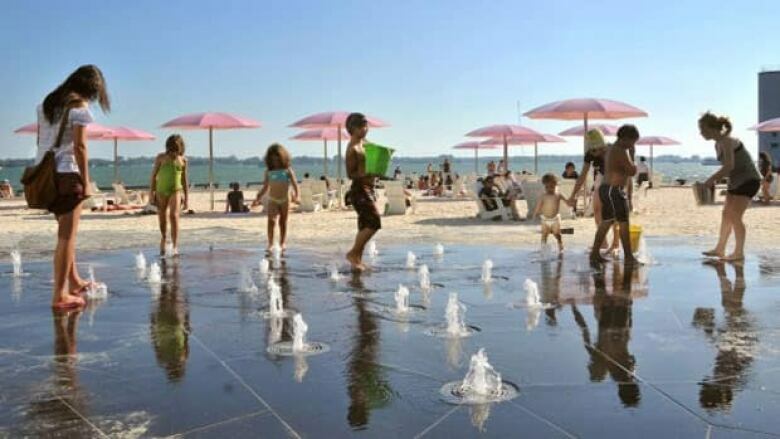 Cherry Beach and Canada's Sugar Beach. Corus Quay, the corporate headquarters of Corus entertainment. The Simcoe and Spadina wavedecks and two boardwalks along the west waterfront. The agency is also currently overseeing a number of other developments, including condominium developments along the east lakeshore and creating a new park along the Don River near the lakeshore. Mayor Rob Ford has a seat on the board of waterfront Toronto, but has yet to attend any of the meetings since he was elected, Campbell said. He said the mayor can appoint a representative to sit in for him at the meetings.